The WatchGuard AP325 is a 802.11ac Wave 2 wireless access point with 2x2 MU-MIMO dual concurrent 5 Ghz and 2.4 Ghz radios. Available with Total, Secure and Basic Wi-Fi subscriptions the AP325 is ideal for medium density environments such as primary or secondary schools, small and medium sized businesses, distributed office spaces and small footprint retail. The WatchGuard AP325 can be deployed with and without a WatchGuard Firewall. Trade In any manufacturer's wireless access point or device for a WatchGuard AP325 with 3-yr Basic Wi-Fi including hardware warranty, technical support, and software updates. WatchGuard AP325 with 1-yr Total Wi-Fi, including the cloud managed, patented Wireless Intrusion Prevention Service (WIPS), Wi-Fi analytics, customer engagement and interaction tools and Standard Support. WatchGuard AP325 with 1-yr Secure Wi-Fi, the cloud managed, patented Wireless Intrusion Preventions Service (WIPS). 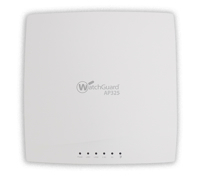 WatchGuard AP325 with 1-yr Basic Wi-Fi including hardware warranty, technical support, and software updates. Trade Up your old WatchGuard wireless access point or device for a WatchGuard AP325 with 3-yr Total Wi-Fi, including the cloud managed, patented Wireless Intrusion Prevention Service (WIPS), Wi-Fi analytics, customer engagement and interaction tools and Standard Support. Trade Up your old WatchGuard wireless access point or device for a WatchGuard AP325 with 3-yr Secure Wi-Fi, the cloud managed, patented Wireless Intrusion Preventions Service (WIPS). Trade Up your old WatchGuard wireless access point or device for a WatchGuard AP325 with 3-yr Basic Wi-Fi including hardware warranty, technical support, and software updates. WatchGuard AP325 with 3-yr Total Wi-Fi, including the cloud managed, patented Wireless Intrusion Prevention Service (WIPS), Wi-Fi analytics, customer engagement and interaction tools and Standard Support.